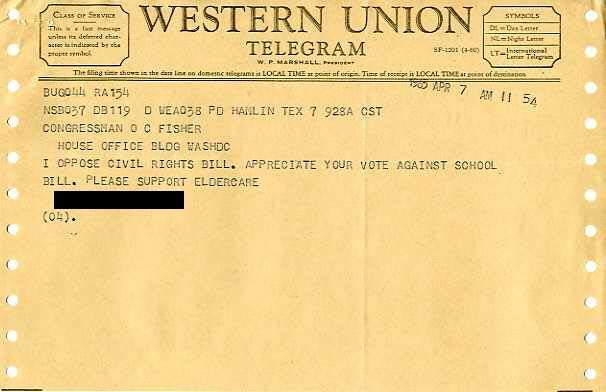 Telegram from a constituent in Hamlin, Texas to Rep. O. C. Fisher on legislation; The telegram reads, "I oppose Civil Rights Bill. Appreciate your vote against School Bill. Please support Eldercare." In his reply, Fisher expreses his support of the eldercare program. Constituent; Fisher, O. C. "Telegram from Hamlin with Reply." O. C. Fisher Papers, Box 443, File "General, Jun-Dec 1965," "Telegram from Hamlin with Reply," April 7, 1965, W. R. Poage Legislative Library, Baylor University, Waco, Texas.. Accessed 19 April 2019. http://acsc.lib.udel.edu/items/show/256. United States. Administration on Aging. ; Older people--Government policy--United States. ; Civil rights--United States--History--20th century. ; Fisher, O. C. (Ovie Clark), 1903-1994. O. C. Fisher Papers, Box 443, File "General, Jun-Dec 1965," "Telegram from Hamlin with Reply," April 7, 1965, W. R. Poage Legislative Library, Baylor University, Waco, Texas.